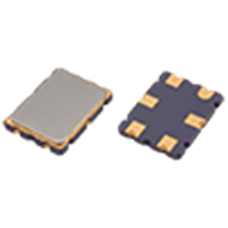 The 45R12B with centre frequency of 45.0MHz features four poles within one miniature surface mount package measuring just 7.2 x 5.2mm. With passband bandwidth of 12kHz at 3dB, the 45R12B also has low insertion loss and guaranteed attenuation of -90±10 @ 80dB. The GSF-75 21R15B 4 pole crystal filter from Golledge with centre frequency of 21.4MHz features a 15kHz 3dB bandwidth and is available in multiple packages, including both UM-1 and UM-5 style leaded packages and UM-1J and UM-5J surface mount packages. This filter also features insertion loss of just 3.0dB dB. Find full specifications here. The GSF-75 21R7B 4 pole crystal filter from Golledge with centre frequency of 21.4MHz features a 7.5kHz 3dB bandwidth and is available in multiple packages, including both UM-1 and UM-5 style leaded packages and UM-1J and UM-5J surface mount packages. This filter also features insertion loss of just 4.0dB dB. Find full specifications here. The GSF-75 40R15B-Z 4 pole crystal filter from Golledge with centre frequency of 40.68MHz features a 15kHz 3dB bandwidth and is available in multiple packages, including both UM-1 and UM-5 style leaded packages and UM-1J and UM-5J surface mount packages. This filter also features insertion loss of just 3.0dB dB. Find full specifications here. The GSF-75 45R15B1 4 pole crystal filter from Golledge with centre frequency of 45MHz features a 15kHz 3dB bandwidth and is available in multiple packages, including both UM-1 and UM-5 style leaded packages and UM-1J and UM-5J surface mount packages. This filter also features insertion loss of just 3.0dB dB. Find full specifications here. The GSF-75 45R20B 4 pole crystal filter from Golledge with centre frequency of 45MHz features a 20kHz 3dB bandwidth and is available in multiple packages, including both UM-1 and UM-5 style leaded packages and UM-1J and UM-5J surface mount packages. This filter also features insertion loss of just 3.0dB dB. Find full specifications here. The GSF-75 45R30B 4 pole crystal filter from Golledge with centre frequency of 45MHz features a 30kHz 3dB bandwidth and is available in multiple packages, including both UM-1 and UM-5 style leaded packages and UM-1J and UM-5J surface mount packages. This filter also features insertion loss of just 4.0dB dB. Find full specifications here. The GSF-75 45R7B1 4 pole crystal filter from Golledge with centre frequency of 45MHz features a 7.5kHz 3dB bandwidth and is available in multiple packages, including both UM-1 and UM-5 style leaded packages and UM-1J and UM-5J surface mount packages. This filter also features insertion loss of just 4.0dB dB. Find full specifications here. The GSF-75 50R9B 4 pole crystal filter from Golledge with centre frequency of 50MHz features a 9kHz 3dB bandwidth and is available in multiple packages, including both UM-1 and UM-5 style leaded packages and UM-1J and UM-5J surface mount packages. This filter also features insertion loss of just 6.0dB dB. Find full specifications here. The GSF-75 70R15B 4 pole crystal filter from Golledge with centre frequency of 70MHz features a 15kHz 3dB bandwidth and is available in multiple packages, including both UM-1 and UM-5 style leaded packages and UM-1J and UM-5J surface mount packages. This filter also features insertion loss of just 5.0dB dB. Find full specifications here. The GSF-75 70R20B 4 pole crystal filter from Golledge with centre frequency of 70MHz features a 20kHz 3dB bandwidth and is available in multiple packages, including both UM-1 and UM-5 style leaded packages and UM-1J and UM-5J surface mount packages. This filter also features insertion loss of just 5.0dB dB. Find full specifications here. The GSF-75 70R30B 4 pole crystal filter from Golledge with centre frequency of 70MHz features a 30kHz 3dB bandwidth and is available in multiple packages, including both UM-1 and UM-5 style leaded packages and UM-1J and UM-5J surface mount packages. This filter also features insertion loss of just 5.0dB dB. Find full specifications here.